A judge at the Western Cape High Court since 2004, Daniel Dlodlo will celebrate his 67th birthday during the Judicial Service Commission’s (JSC) April 2019 round of interviews. An analysis of his judgments regarding civil and political rights suggests he can give deferential legal gifts to the other arms of the state at times. In 2015, at the height of former president Jacob Zuma’s use of nefarious state surveillance methods to hinder government transparency, the State Security Agency jammed mobile telecommunications signals and prevented the televising of parliamentary events during the state of the nation address. Members of the Economic Freedom Fighters (EFF) protesting against Zuma were violently removed from the parliamentary chamber by security during the information black-out. At issue was the constitutionality of the provision of parliament’s policy on filming and broadcasting relating to broadcasting incidents of grave disorder and unparliamentary behaviour, and the jamming incident. Dlodlo held that the court lacked jurisdiction to consider an attack on the policy as a whole. Dlodlo said courts should “guard against conduct which amounts to what can be described as an intrusion into the constitutional domain of parliament, which is not only unprecedented but which also has obvious major constitutional implications”. The application was dismissed, with each of the parties paying their own costs. Judge Kate Savage dissented, finding that the measures in the policy were unconstitutional, and that as the jamming had not taken place with the permission of the speaker or chairperson of the National Council of Provinces, its use in the parliamentary precinct was unlawful. Unsurprisingly, the majority judgment was overturned by the SCA, in Primedia (Pty) Ltd and Others v Speaker of the National Assembly and Others. Dlodlo again appeared overly deferential to the national legislature when the Economic Freedom Fighters (EFF) approached the Western Cape High Court asking for relief from a decision to suspend its members without pay, by the speaker, Baleka Mbete. The application also sought a declaratory order that the National Assembly had failed to fulfil its obligations to ensure then president Jacob Zuma was held accountable — as per the public protector’s Secure in Comfort report — for upgrades to his personal homestead in Nkandla. Dlodlo refused to overturn the speaker’s decisions and sanctions claiming it was not the court’s role to “second-guess” parliament. In the 2007 matter of Fanti v Boto and Others, Dlodlo was faced with an interesting customary law question regarding gender rights. The day before the daughter of the first respondent was to be buried an urgent application to stop the funeral was brought by a man claiming to be customary law husband of the deceased. He also sought a court order declaring his entitlement to the custody and control of the body and that he was solely qualified, as the husband, to determine where, when and under what conditions it would be interred. The husband had argued his having paid lobola was evidence of his customary law credentials as husband. Dlodlo noted that payment of lobolo remained merely one of the essential requirements for a valid customary marriage and, alone, would not render a relationship a valid customary marriage. “The applicant seemingly alleged that … he merely wrote a letter to inform the first respondent (mother of the deceased) about what was to happen. The applicant probably was of the view that the first respondent merely because she is the mother and not the father had no locus standi in the contemplated customary marriage proceedings. I want to make it very clear that the mother of a girl whose father died or is for some other acceptable and understandable reason absent and/or unable to discharge duties normally meant for the ‘kraalhead’, is quite entitled to act as the head of the family. Such mother becomes the ‘father’ and legal guardian of the children of her family,” Dlodlo found. This, he stated, was in accordance with the spirit and object of the Constitution. He further held that the bride had not been handed over or any rituals or celebrations performed. Or evidence that lobola negotiations had been finalised. The application was dismissed with costs. 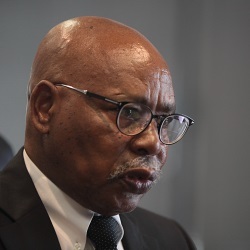 A former commissioner of the small claims court in Vryheid, he has also acted at the Labour Court, the Labour Appeal Court and the Constitutional Court in 2018. He has acted at the SCA for two terms in 2016 and one further term in 2019. Dlodlo obtained a B.Proc (1979) and an LLB (1982) from the University of Zululand. Dlodlo has worked as a court interpreter and a public prosecutor before becoming an attorney. The Judicial Service Commission (JSC) has a soft spot for eccentrics — how else to explain the 2013 appointment of The Contrarian of Constitutional Court Judgments, Nigel Willis, to the Supreme Court of Appeal (SCA) when there were eminently more appointable candidates, pale-male or otherwise. Similar in approach to Willis, Western Cape Judge Daniel Dlodlo was avuncular and breezy during his hour-long interview, as he cracked jokes, talked theology with the born-again Christian Chief Justice, expounded on the value of his judgments which death with customary law and extended the metaphors presented to him by commissioners. All sure winners with the JSC and, through fits of giggles, and a warm, fuzzy feeling in their bellies, Dlodlo made its five-person short-list for appointment to the SCA. Commissioner Dali Mpofu, representing the advocates profession, asked Dlodlo whether the commission should favour youth over “experience and judicial pedigree” when considering the candidates. When asked later by commissioner Jomo Nyambi, an ANC member of the National Council of Provinces, whether he had never met a young person who was mature for his age, the laughter in response to Dlodlo’s jokey riposte confirmed the commission’s warmth for him: “It’s possible,” he said, comparing such an old soul to an “orange that has got a lot of manure” before stressing that time was the ultimate sweetener in his well matured mind. Dlodlo was asked about his ruling in the 2015 “signal-jamming” matter — when State Security Agency operatives had prevented a broadcast of former president Jacob Zuma’s 2015 state of the nation address while there were violent altercations in parliament — which was overturned by the SCA in the coruscating Primedia (Pty) Ltd and Others v Speaker of the National Assembly and Others. His original judgment also drew academic criticism for appearing overly deferential to the legislature in matter which touched on freedom of speech matter and separation of powers issues. He said that because neither the speaker in the national legislature, nor the chairperson of the National Council of Provinces, had been aware of the jamming — that “there was no offending party” — the matter, in his mind, was moot. Dlodlo said he “accepted whole-heartedly what the Supreme Court of Appeal had to say” about his judgment. He went on to talk passionately about how the law obsesses him, to the extent that he “jumps” up in the middle of the night sometimes to note a point in a case: “Sometimes my wife thinks I’m not right in my head,” Dlodlo told the commission to laughter. Dlodlo was also asked questions about the “principle of necessity” and his role in advancing the development of customary law, especially in relation to his progressive decision in the 2007 matter of Fanti v Boto and Others. The commission were in more stitches than a Road Accident Fund applicant when he said “a guy like Dlodlo” who was “simplistic” and had “humility” would be just the antidote for the toxic atmosphere at the SCA. This was duly noted, amongst others, when he was appointed.